Description: Dr. David Darom's book is unique among books about custom knives. For the first time, a book has been created that has unparalleled photography and information about some of the best folder makers in the world. Dr. Darom selected 22 featured artists and has presented their art on eight pages each. He also chose nine custom folder makers whose work and designs are characteristic of today's modern handmade folders and displays their knives on two pages each. More than a dozen different custom folder makers are also represented in the book, the beauty of their art displayed on one or more pages. This book provides insight into the personal lives of the artists as well as their thoughts and feelings about their craft -- breathing life into steel objects. This was achieved only by the full and enthusiastic cooperation of everyone involved, presented here in the form of their biographies and signed personal statements. To complete the documentation of this astounding modern art form, a group of world experts wrote an original introduction to the book. 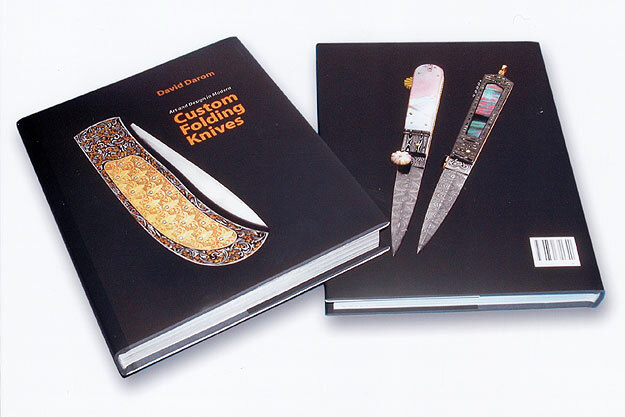 The introduction includes such topics as The Art of Mosaic Damascus (Steve Schwarzer), The Art of Engraving (Steve Lindsay), The Art of Scrimshaw (Linda Karst Stone), Anodizing Titanium (John Lewis Jensen), Locking Mechanisms in Folders (Ron Appleton), Knife Shows, Collecting Hand Made Knives (Bud Lang) and Collecting as a Way of Life (Dr. Pierluigi Peroni), all covered in detail with original illustrations.